Weirdly I’ll have work in two places a stones throw from each other in the centre this week never having had anything in that area before. I’m supporting the CRUSE Heartfelt Art Exhibition which is launching Tuesday evening and will include work by local artists like Dawn Sidoli RWA and Tom Hughes. It’s running until next Saturday. 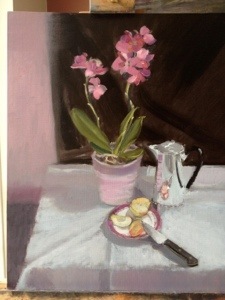 I’ll be submitting some work for the auction including “Orchids in Pink and Black” below. There’s an anonymous A5 art sale too so you’ll be able to play spot the artist and perhaps pick up a bargain. This entry was posted in exhibiting and tagged bristol, Exhibiting, oil paint by ianpriceart. Bookmark the permalink.